Tottenham Hotspur are reported to be interested in signing Spanish internal Alvaro Negredo according to British newspaper, The Daily Star. Spurs boss Andre Villas-Boas is said to be eager to bring the Sevilla striker to White Hart Lane during the January transfer window as fears grow over Tottenham’s reliance on Jermaine Defoe. The England international has already started the majority of Spurs’ games this season and Villas Boas is understood to be concerned over Defoe’s fitness during the latter stages of the season – should reinforcements not be brought to the North London club in the New Year. 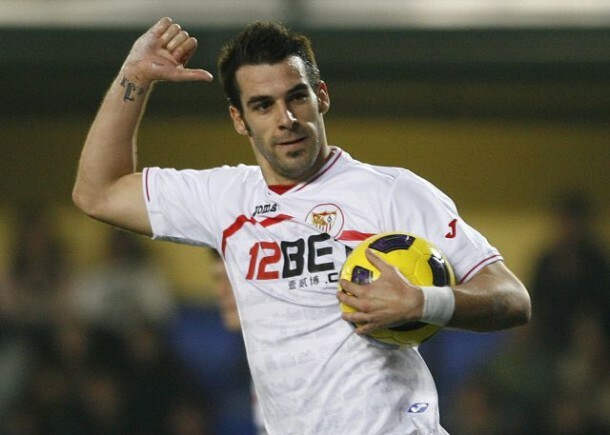 Negredo has been in impressive form for Sevilla this season and has bagged six goals in just nine games for the Andaluz club. Spurs chairman Daniel Levy is understood to have previously attempted to bring the 27-year-old to White Hart Lane, however, with the La Liga likely to demand at least £20 million for Negredo, Tottenham will have to dig deep if they want to prise him away from the Ramon Sanchez Pizjuan. Spurs have experienced a number of niggling injuries this season and fell to a disappointing 1-0 loss to Wigan Athletic at White Hart Lane on Saturday.